Emirates has announced a third daily service to Birmingham Airport, becoming the first airline to offer a direct First Class service to the region. Commencing Saturday 1st August 2015, Emirates flight EK41, operated by a Boeing 777-300ER, will depart Dubai International Airport at 0235hrs and arrive in Birmingham at 0705hrs. The outbound flight, EK42, will depart Birmingham Airport at 0910hrs and arrive in Dubai at 1910hrs. The additional service adds seven more inbound flights a week to Birmingham, increasing passenger and cargo capacity on the route by 42 percent. Emirates started flying to Birmingham in December 2000 when it launched the route with a daily non-stop service, operated by a 278-seat Airbus A330. In the 14 years since, Emirates has carried over 4.9 million passengers to and from Birmingham. Passengers flying from the Midlands can travel to Dubai and beyond, to an ever expanding global network. Popular destinations on the Emirates network from Birmingham include Dubai, Australia, India, Singapore, Bangkok and Hong Kong. Paul Kehoe, Birmingham Airport CEO, said: “Emirates’ decision to add a third daily service to Dubai and beyond from Birmingham Airport clearly shows the strong demand that exists in the city and the region for passengers who want connectivity to Dubai, Asia and Australia. The new daily service will be operated with a Boeing 777-300ER aircraft in a three class configuration. 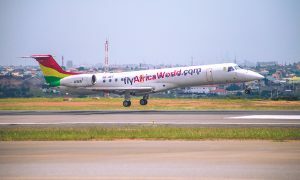 The added capacity provides eight Private Suites in First Class, 42 Business Class seats and 310 Economy Class seats per day, as well as 23 tonnes of additional cargo capacity per flight.